What do you need after a long flight? Maybe a coffee or whatever your favorite drink is! Or just a quick dash home, to crash and revive! Ah, oh, hold on, you need your bags! Now imagine a world where it takes hours to get your baggage from the airport conveyor. Would have been dreadful, isn’t it? Thankfully it isn’t so and you do get your baggage pretty swiftly once you alight. How is the on-time baggage delivery tracked and ensured? Airport Baggage Analytics! Well, ground handling teams need to adhere to service level assurance (SLA) for first on belt as well as last on belt. For example the SLA for first baggage on belt after arrival could be 80% compliance to a 15 minutes turnaround time while that for last baggage on belt could be 80% compliance for a 45 minutes turnaround time. Sounds good! But how do you track deviations, non-compliance and take corrective actions? How do you achieve the appropriate airport baggage analytics? 5 ways to improve your Airport Ground Handling Operations! Read Now! This is where a solution like GrayMatter’s Airport Analytics (AA+) comes in. 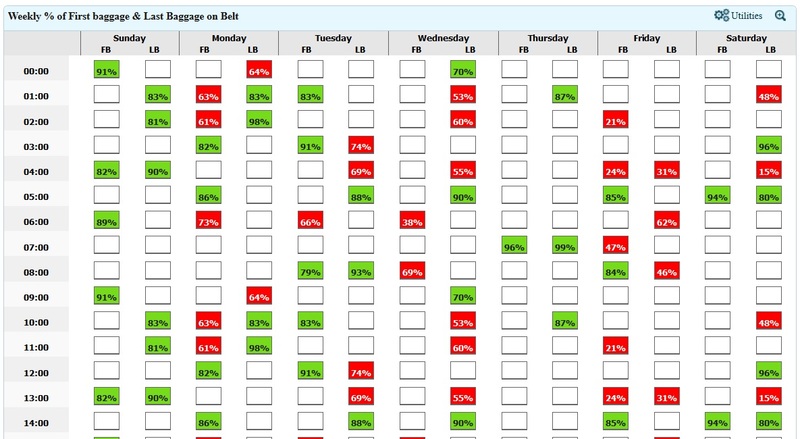 Baggage claim dashboards in the AA+ solution track such SLAs on an hourly basis for all days of the week. Have a look at the dashboard below. The slots in green indicate compliance to SLA while the ones in red are alerts for non-compliance. Airport Analytics (AA+) provides further detailed and interesting analysis including metrics on SLA compliance by airlines, by cities and so on. The dashboards and analyses are easy to use and at the same time very detailed with multiple drill-downs leading to root cause analysis and hence corrective action. In summary, a comprehensive system that can monitor events and trends and trigger corrective actions, well in time! Happy travelling then! Fly High!